Tea with the Midnight Muse Book Release HERE! Hurray a new book goes out into the world! You may or may not know that I have been working on a book for about twenty years lol. It feels like forever. It does have poems in it that are twenty years old – but it mostly has my newer stuff. 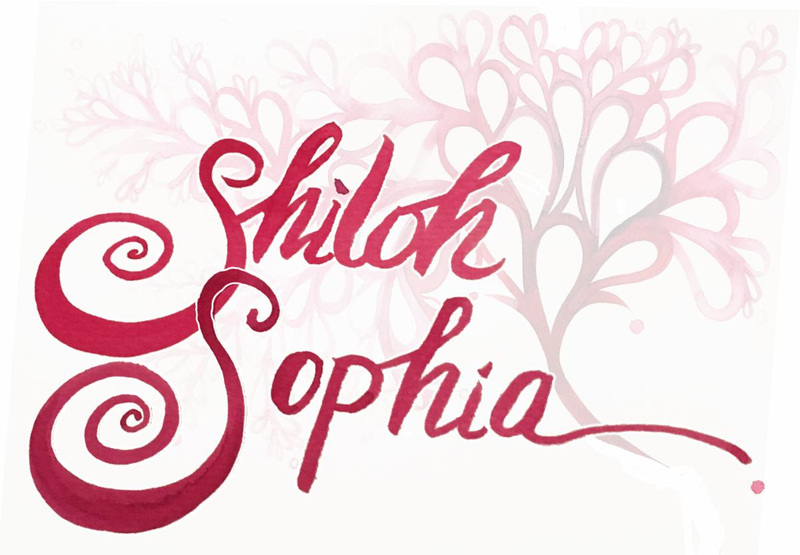 It is filled with prose that was written in these Red Thread Letters to my Beloveds. Each poem, which I call an invocation, is followed by an inquiry and journal prompt if one should choose to dig deeper. They are great for random choosing, and reading in circles, rituals and on calls and just to lift your spirits when you are blue. It is rascally and wild, and sweet and sacred. In my humble opinion. And it is dedicated to my Mama, Caron McCloud. As you likely know – my poetry isn’t traditional in any way – doesn’t follow a form and is mostly written for and from the collective feminine. So MOST of the book speaks to women where they are – the second part of the book is personal to me, my family, my husband, my muse and has some of the darker content. Shadows included. On Friday I am doing a poetry reading via livestream from my studio – it’s free and you can watch live or watch later. If you order now you can get it in time to read along. For those who watch live I will have some special raffles for some pretty awesome give aways. Then on Saturday I am having an in person (Sonoma) and streamed workshop. 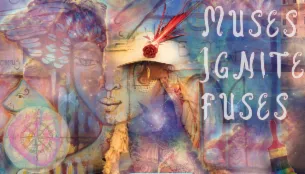 What I am OVER the moon about as well – is the the GLOBAL MUSE DAYS are featuring the work of the Intentional Creativity teachers – even if you don’t think you can join any of it, come and see what sisterhood and community and dedication have created! Women teaching and working together all over the world in creativity. My cup overflows. Tea with the Midnight Muse Book! This is also where you can sign up for the FREE livestream on Friday – you can sign up now and watch later too. Plus my workshop this Saturday in Sonoma – or livestream watch! COME FIND ONE WHERE YOU ARE! See our RAD Global Calendar Here. I am in a state of continual awe – not the good kind – about what is happening in the world right now. And so the first thing I am focusing on for my self care – is to nurture my creative fire first – otherwise I won’t be any good to others. Intimacy with one’s internal guidance system, she who is called the Muse around here, provides a resiliency and potency to our interactions with ourselves, and others. I want to continue to be empowered to serve. Sending you blessings where you are – all along the red thread. Imagine a red thread coming to you right now…..and feel connected to it. It is time for connections to strengthen. 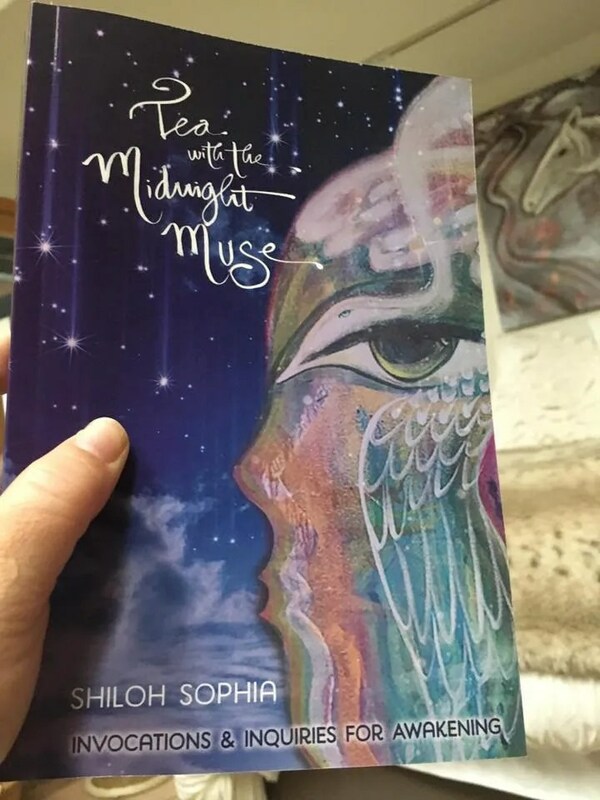 Tea with the Midnight Muse is a collection of poems, rants & prayers written over the span of twenty years to Shiloh Sophia’s global community as “Red Thread Letters’. She considers these writings ‘medicine for the soul’ as she speaks from her own experience as well as the story of the collective feminine. “This work is an invitation to take a deep dive into the uncharted territory of the muse as an access point to your own creative fire. Here you discover the sweetness where suffering and joy meet, and ask one another to dance in the mystery”. Part One features over 55 inspirational invocations followed by creative practices which each include inquiries, teachings, and mini-guided journeys. You are led across an alchemical bridge into a secret room of your own. Here you may encounter your own Muse and see what wants to be revealed. The content is designed to awaken and catalyze the reader to choose themselves, their lives, their own creative soul and dive in to what’s possible. Part Two Features another 24 writings, a personal encounter with Shiloh Sophia’s wild-hearted muse who lures her with peanut butter, chocolate and leopard print lingerie, as well as introduces you to the characters in Shiloh Sophia’s life, both the dark and light figures which have shaped her into who she is. This is a call to transcend the old stories and patterns and step into a new framework. 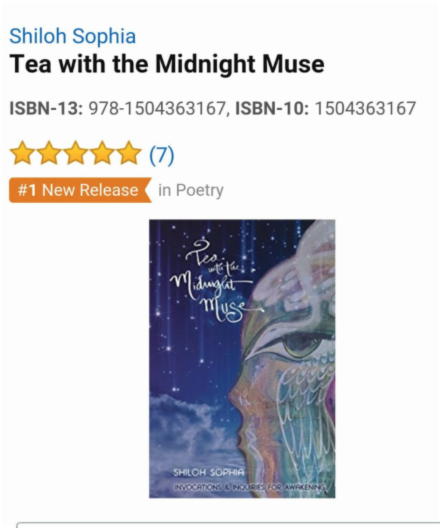 “The Muse shows us what we did not see only moments before, that which is peaking out just behind the veil of consciousness and beckons us to the unknown.” So get a cup of tea, light a candle, get a journal and some colored pens and let’s dive in to Tea with the MidnightMuse. You never know what might be revealed. Proceed with caution, contents may have shifted during flight…. The wild one lives within all women. She is known as Medicine Woman. Medicine Woman knows stars and sums. and golden boots with wings. with teenage girls on Friday night. and the sacred heart of Jesus on her right bicep. as she roller skates through New York’s Central park. She pays for everything with cash. She paints glitter on her toe-nails. Just don’t think you have her figured out. She may let her armpit hair grow. And wants to give it all up. She rides motorcycles up the coast. and has multiple income streams. She asks the question – Who are you not being? Her life is her own. She is on her own. And she likes it that way. drunk with aliveness and honeycomb cake.